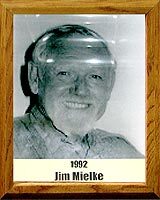 Jim Mielke, a 1955 graduate of Tucson High School, said that as a youngster he was “just an average” sprinter and basketball player. However, Jim was anything but just average during his outstanding career in which he coached teams and individuals to city, state and national championships in track and cross-country at Sunnyside Junior High, Sunnyside High and Pima Community College. An Athletic Congress certified official, Jim’s leadership in the development of track, cross-country and marathons is recognized locally and throughout the U.S. He also was instrumental in founding the Tucson Marathon and promoting track and field participation within the Senior Olympics. Jim was named National Cross-Country Coach of the Year in 1980. He served as president of the National J.C. Track and National J.C. Cross-Country Coaches Associations and is a member of the TAC Board of Directors (National Governing Body). His legacy is found in his dedication and commitment to the education of those less fortunate, often at great personal sacrifice. The products of this caring individual are evident in the many success stories of individuals whose lives were touched by him and who are now leading more productive lives. Coach Jim Mielke received his Masters in Education at the University of Arizona.